Sometimes, I'm forced to write such articles. Because, that's how my mentality is, at that time. Nobody has betrayed me, as such. But, the line is true- People do Change. After moving further in life, you feel you have started gaining the things, the goals and the objectives that you had once set. But when you look back, you see, the people that meant most to you, are not the same, anymore. Yes, they do love you, they still consider you as someone special and dear to them. But the question is, really? I repeat, once again. Nobody has betrayed me. I still have all those special people with me, yeah, except for one or two. The point is, we have two options left...either to slap them hard and forgive them, or just forget that they ever existed in our lives. 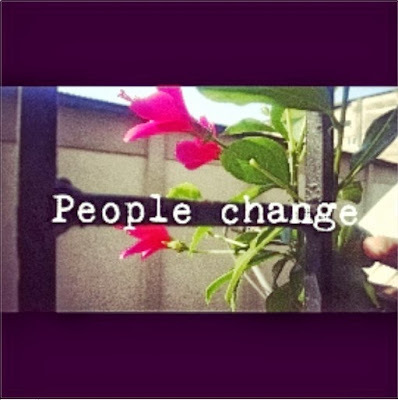 I've been facing this people-change-they're-not-the-same-anymore problems since a year, now. But I've tried to move on. I've started finding jewels, out from a garbage bin. And these jewels are shiny and special. We all have to face such people in life. But don't worry. Do you believe in Karma? I do. I do believe in 'What goes around, comes around' thing. So, all that is must, is to keep quiet and find worthy people, and stick to them, yes, STICK to them. Now, I'm residing with jewels, and have forgotten all the garbage that once meant something to me.